Annapolis kids can channel their inner pirate with the delightful “The Day I Became A Pirate” book app by Cary Snowden. The story is written in catchy rhyme punctuated with swashbuckler speak and boy-friendly grossness: guts, armpit hair and a belch for good measure. A motley crew of rotten pirates descends on a tropical beach looking for help for a sick crewman. They see a young boy and appeal to him for aid. The frightened youngster figures out why the tattered buccaneer is in pain, gathers his courage and performs a swordfish extrication (you DID NOT see THAT coming!). 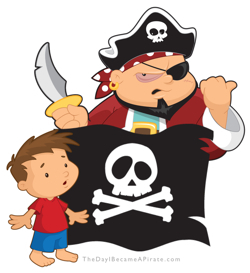 The thankful captain rewards the boy with his booty and pronounces him a member of his pirate band. Annapolis readers have the options of listening to the story read in salty pirate dialect or reading the text from the scroll on each page. Nine hidden clues are interspersed throughout the adventure. When all the clues are found, Baltimore readers are rewarded with a bonus video that reveals a secret part of the story. Though pirates are not known for teaching wholesome virtues, this tale portrays compassion, loyalty, courage, gratitude, and generosity. The Day I Became A Pirate is available on iTunes for iPad and iPhone. Download it today for yer favorite Annapolis scalawag. Visit http://thedayibecameapirate.com for more piratey goodness! This entry was posted in Publishing on April 7, 2016 by admin. September 19th is International Talk Like A Pirate Day in Annapolis, Maryland. Feel free to appreciate this with all your friends in Barnesville, Rockville, or Frederick, and take a moment to check out an extraordinary children’s pirate book by Cary Snowden titled The Day I Became A Pirate for your iPad. Happy celebratin’, me hardies! Yarrr! This entry was posted in Publishing on September 18, 2013 by admin.